Some years ago, a prominent Protestant clergyman offered the suggestion that Rosh Hashanah and Yom Kippur could very well be adopted as religious occasions for people of all faiths. He was intrigued by the predominance of the theme of universalism in the Days of Awe. Passover, Shavuot, and Sukkot convey their respective messages of human freedom, of man’s duty as a moral being, and of the thanksgiving man owes to God, in the context of the historic vicissitudes and experiences of the ancient Israelites. Rosh Hashanah and Yom Kippur, however, are not related to any particular event in Israel’s past. They are, as Yehezkel Kaufmann characterizes them, “cosmic holidays” linked with the hopes and the destiny of mankind. The liturgy of Rosh Hashanah and Yon Kippur is indeed suffused with the spirit of universalism. I suppose I’m crazy to post this, since most Christians wouldn’t even begin to “resonate” with the High Holy Days that are rapidly approaching. And yet, as Arzt notes, an anonymous Protestant clergyman of some prominence in a past era undeniably saw a more universal application to God’s judgment and mercy. Isn’t that because God will indeed judge all the earth? Aren’t we all under His authority. Does He not have the right to elevate or to condemn? Did He not love Jacob, heir to the covenant promises, but hate Esau who was a descendent of Abraham and Isaac but not in line to receive favor as a Patriarch? And yet at the end of days, God will judge the descendants of Jacob and Esau both. The persecution to which R. Yehudai Gaon alluded is the injunction issued by Justinian in 553 C.E. against teaching the deuterosis, the oral interpretation of the Torah. Scholars had therefore assumed that when Judaism “went underground,” certain piyyutim replaced the prescribed liturgy and that other piyyutim of a more legalistic content served as a means of circumventing Justinian’s prohibition against teaching the Oral Law. While many Christians today boast a love of the Jewish people and the nation of Israel, we still bristle at the thought of the Oral Law, since it has long been a tradition in our own religious stream to love the Bible (and our own traditions) but disdain the traditions of other faiths, particularly Judaism. 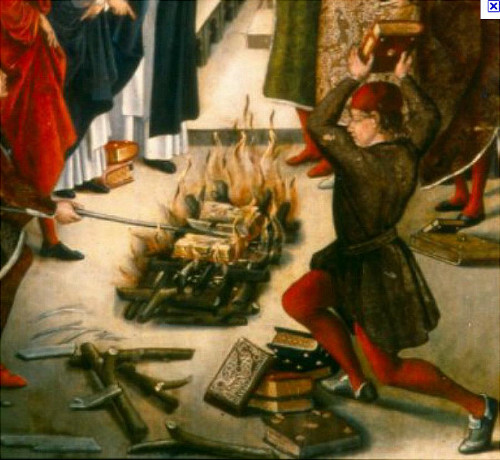 We may not physically burn volumes of Talmud anymore, but we continue to do so in our minds and hearts. In America, Jews are free to practice their religious faith which includes Talmud study and worshiping according to the customs, but historically Judaism has survived, in part, by periodically going “underground” or at least maintaining a low profile. Some of the other Judaisms object to the behavior of the Chabad because they can be so “in your face” about being Jewish, and are very definitely “above ground”. We like to remind people that America is a Christian nation (actually, it isn’t and never has been) but imagine how insecure that could make a Jew feel? Anti-Semitism isn’t extinct in America or any place else, it’s just waiting for the right environment in which to once again flourish. …Thus the Synagogue was well prepared to assume its post-exilic role as the center of Jewish education, worship, and communal welfare. That the people recovered so quickly from the traumatic effects of the destruction of the Temple was due to the fact that for some centuries before 70 C.E., the Synagogue had been a functioning institution with a reasonably well-established liturgy. The Rabbis tell us that God prepares the healing before the hurt (Song of Songs Rabbah, 4:5). I’ve maintained over the years that it was indeed the synagogue, the liturgy, and the Talmud that preserved the Jewish people in the centuries after the destruction of the Temple and the initiation of the longest exile they would ever endure, particularly after two failed rebellions against the Romans and the non-Jewish disciples of Yeshua (Jesus) betrayal of their Jewish counterparts. Apparently a Gentile sub-population could not be sustained within a Judaism in exile and under siege by the powerful nations around her scattered people. That’s quite a statement and an indictment against collective Christianity, but it might not be entirely unearned. While I’m not the student of history I wish I were, I do know that as much as modern Christianity depends on the work of the men of the Reformation, its chief architect, Martin Luther, toward the end of his life, was no friend to the Jews. First to set fire to their synagogues or schools and to bury and cover with dirt whatever will not burn, so that no man will ever again see a stone or cinder of them. This is to be done in honor of our Lord and of Christendom, so that God might see that we are Christians, and do not condone or knowingly tolerate such public lying, cursing, and blaspheming of his Son and of his Christians. For whatever we tolerated in the past unknowingly ­ and I myself was unaware of it will be pardoned by God. But if we, now that we are informed, were to protect and shield such a house for the Jews, existing right before our very nose, in which they lie about, blaspheme, curse, vilify, and defame Christ and us (as was heard above), it would be the same as if we were doing all this and even worse ourselves, as we very well know. If I had lived in those days and had been a devotee of Luther, how could I have possibly imagined that God loved the Jewish people, had plans to restore them to their Land, and was continuing to uphold His covenant relationship with them? How could I even believe the words of Jesus when he said “Salvation comes from the Jews” (John 4:22)? This leads us back to the “universalism” of Rosh Hashanah and Yom Kippur. Contrary to popular belief, Yom Kippur or the Day of Atonement is not an exceptionally depressing for fearful day for most religious Jews. My wife explained to me one year that it’s actually an opportunity to hit the reset button of our lives, to repair faults and faulty relationships, and to take advantage of an opportunity laid at our feet to become better people and build a better future. While there’s been a great deal of improvement in the relationship between Jews and Christians since the Holocaust, there is still a lot of underlying tension. There’s still a lot of “unexamined baggage” both Jews and Christians are carrying around about each other. To be fair and given recent events, there’s also a lot of baggage I’m carrying around about other Christians that needs to be examined and cleaned up one way or another. I suppose the fact that Rosh Hashanah begins This coming Wednesday the 24th at sundown with Yom Kippur following at sundown on Friday, October 3rd could provide all of us the opportunity to do better and be better than we have been so far. I know I need something like this. Sure, we can repent and draw nearer to God and to other people any time of year, but when do we have an engraved invitation from God to do so? 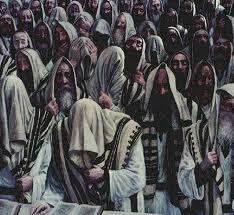 I’ve heard D. Thomas Lancaster call Yom Kippur a “dressed rehearsal” for the final judgment. Even if, as a Christian, you feel assured of your salvation, that doesn’t mean you are perfect. I know it doesn’t mean I’m perfect, not even close. Rehearsals are opportunities to practice an important event to make sure you get it right before the real thing happens. That’s a pretty good reason for all faiths, and truth be told, all human beings to observe the universalism of the Days of Awe, for indeed awesome days are coming and when they arrive, if we are not prepared, we never will be. Christianity still has much to repent for about how we think, feel, and sometimes treat the Jewish people, particularly religious Jews. What have you done that you need to repent of? “… anti-Judaism is the fundamental root of later cultural and political antisemtism,” (Gaston, Paul and the Torah). If a Christian is truly repentant then he will extricate himself from an anti-Judaic religious system (i.e. Christianity) and cease to identify as a Christian. That seems a little extreme, Peter. If someone had said that about Jewish people, it would be considered anti-Semitic. You go to a church. Presumably, you have friends there who identify as Christian. Do they know how you feel about them? If there’s a Messianic Jew who goes to a non-Messianic synagogue to tell his Jewish friends about Yeshua the Messiah, does that make him hateful towards Jews? I reach out to Christians in the same way a Messianic Jew reaches out to non-Messianic Jews. How is that hateful? You don’t have to justify yourself to me, Peter. I just always hope that at the end of Elul, with the High Holidays rapidly approaching, that the pundits in the blogosphere would soften a little toward each other and the world around them. The only person’s teshuvah each of us needs to be concerned about is our own. God will take care of the rest in His own time. Actually, James, it’s Rosh HaShanah (i.e, Yom ha-Din) which is the dress rehearsal for the final judgment. Yom haKippurim is when the verdict is determined after all pleas have been heard. But rabbinic opinion regarding the judgment for non-Jews delays it until Sukkot, and specifically to the water ceremony of Hoshanah Rabba, perhaps reflecting Zecharyah’s warning about not receiving rain upon their lands. Oops. My mistake. Thanks for the correction, PL. Hmmm. Interesting point about non-Jews and Sukkot, which fits Zechariah 12 as you say. PL to blame Christians for the murders and other evils done throughout history in the name of the church (even in the name of Christ) is little different to calling Jews “Christ-killers”. One difference is that SOME Jews were involved in calling for His death, while NO true followers of Jesus have been involved in murder; because an act of murder would be proof that they WEREN’T following Jesus. Tim, I closed comments on the other blog post for a reason and you’re dancing pretty close to the line where I start enforcing my comments policy more strictly. The fact remains that historically, Christianity is guilty of heinous crimes against the Jewish people and the doctrine of anti-Semitism and Jew hatred was widely taught in the “bad old days”. We can’t dodge that bullet but we can repent, which interestingly enough, is what this blog post is all about. I’ll let this conversation go forward but if it degrades into name calling by *anyone*, I’ll close comments down and/or start editing/deleting comments. I don’t like to do that, but as a responsible blog owner, I have to maintain a certain level of integrity in the comments I allow. “PL to blame Christians for the murders and other evils done throughout history in the name of the church (even in the name of Christ) is little different to calling Jews “Christ-killers”. You’re right, “O”, that one cannot blame all Christians for the evil done by some, just as one cannot blame all Jews for any action participated in by a few. Nonetheless, one also cannot claim that these Christians were not Christians, merely because they did not behave consistently with some ideal definition of how they ought to have behaved. As James has pointed out, these Christians were behaving consistently with Christian teachings that have been common to Christianity since the Nicene Council, if not also beforehand (e.g., Justin, Origin, Chrysostom). That cannot be said of the Jews in Pilate’s courtyard who preferred Barabbas to be set free rather than Rav Yeshua; nor can even those few Jews properly be called by the epithet “Christ-killers”, because they did not conduct the Roman execution that they condoned. One might argue that evil-perpetrating Christians actually were “true followers of ‘Jesus’ “, as he and his supposed teachings had been defined for them, though certainly they were not disciples of the genuine Jewish Messiah figure of Rav Yeshua; and this is why there exists a degree of ambivalence, among modern Christians who are aware of the history, about continuing to use the label “Christian”. They are unsure whether it is possible to cleanse the “stain” out of “Christian”, or if it was an error that a prior ancient assemblage of non-Jews should have adopted this pejorative Greek slur in the first place. What is the character of true repentance? What sins does one acknowledge in order to turn away from them? What does one turn toward instead? Is there any collective guilt underlying personal guilt; or is one responsible only for one’s own errors (viz: Ez.18)? In what degree are one’s own errors the product of someone else’s errors or influence? What restitution, if any, may be required to demonstrate repentance? In what ways may one contribute to repairing damages in the world around them which are a reflection of one’s own prior errors? These are among the questions that anyone may ponder at this season. May we all hear the shofar’s clarion call this Yom T’ru’ah, and stand in awe of the Judgment due on Yom haDin, that we may be renewed once more at this Rosh haShanah high point in the Jewish year, for life and good rather than death and destruction, in reliance also upon a perennial kapparah that covers our failings in mercy on Yom haKippurim. Nothing I can add to that. Well said. Nonetheless, one also cannot claim that these Christians were not Christians, merely because they did not behave consistently with some ideal definition of how they ought to have behaved. I suppose it all depends on whether your views on Christian identity are rooted in tradition or are based on BIBLICAL foundations. There is a huge difference between the two. But it is more than obvious that many people esteem tradition above the revelation of scripture. The problem, “O”, is that the bible does not define any sort of “Christian” identity whatsoever. The only use of the term in the apostolic writings is three brief references: one citing (gentile) Antioch as the first place where the term was used, one where Agrippas invokes the term mistakenly as identifying that which Rav Shaul was trying to persuade him to become, and one where Kefa cites the term as a label used to provoke denigration and persecution of Rav Yeshua’s followers. One cannot build a “Christian identity” from these. The only historical basis that exists on which to build an identity under such a label is the traditions reflected in Nicea and subsequent church councils. This identity and its history are rather in conflict with what I perceive to be the biblically-founded identity you would like to claim for non-Jewish disciples of Rav Yeshua who therefore reflect his values and teachings. The actions attributed to “Christianity” and “Christians” were the NOT done by Christians – a term used in scripture to describe followers of Jesus. So it should not be acceptable to make a link between those murderers from the past with genuine followers of Jesus throughout history and into in the present. There is no link. Paul said that no one is righteous, not one of us. The state of the heart of those people in the Church who committed terrible acts, often in the name of Christ (or so they said) is apparent, but even those Christians who didn’t participate were taught by their church leaders that such actions against Jews was right. Martin Luther toward the end of his life, advocated for burning down synagogues, and incinerating Torah scrolls and volumes of Talmud and did so in writing…and he was one of the architects of the Reformation. An entire denomination and its various synods, is based on his teachings. Maybe Luther wasn’t a terrible person in all of the ways he related to God and to other people. After all, he did oppose exceptionally corrupt practices of the Catholic church. But his attitude toward the Jews was still wrong. I think there was a point in the church’s history where even if many or even most Christians weren’t participating in active violence, they passively accepted and approved of it because as victims of disinformation and corrupted theology and doctrine, they really thought being an enemy to the Jewish people was approved of by God. That indicates why we need to have faith in Jesus so we can be forgiven and changed. It is not an excuse for continued unrighteousness. It doesn’t give a free pass to continue in sin even though we’ll continue to have areas of more subtle sinfulness in our lives that we need to be made aware of (another role of the Holy Spirit) so we can confess that area of sin and turn from it. The wrong of tmurder could not be clearer and there is no room for a “Christian” to be guilty of it or to try to excuse it. A wilful murderer is no Christian and no murderer can be a Christian until he/she repents – which includes putting an end to murderous activity upon coming to faith in Jesus. I was briefly on another site researching something, and caught a standardised Christian teaching that the Moedim, the appointed feasts of Adonai, were nailed to the cross along with the rest of Torah, and Torah Observance, rather than the curses pertaining to the Torah. Christians are taught to believe that Jewishness, and the Torah was nailed to the Cross, and along with it obedience. The site was foolish in their statement, but most Christians are taught this, year after year, no matter what, and most Christians are hardly aware that the Feasts are the full portrait of Mashiach from Cruxificion to Returning in Glory. They don’t catch anything of what the Feast days remember, for that is more a covenant matter for the Jews, but they refuse to teach anything much about keeping the feast days that G-d appointed. Christians may catch a glimpse of Passover, but not the Feast of Unleavened Bread; they might observe the day of First Fruits on a non-Jewish Pagan celebration called Easter on their chosen calendar day, worshipping the goddess Astoreth; they do not celebrate either the giving of Torah or the Falling of the Holy Spirit on the actual day of Shavuot, although they may talk about it in a sermon; they entirely miss the point of Yom Kippur to the national redemption of Israel in Yehoshua, which includes all Believers in Yehoshua as we are grafted spiritually into the Root of Israel; they refuse to celebrate the official celebration of the beginning of the Biblical Calender Year at Rosh haShannah; and see nothing in the Feast of Trumpets and Sukkot, which pertain to the Judgement of the Peoples of the Earth, and the bringing in of the Messianic Age. Any mitzvoth carried out by Jew or Gentile is a gift of love to G-d, whether it is honouring the Sabbath, or celebrating the Feast Days, the appointed times of the L-rd, even if they are not kept in a Jewish manner. They are G-ds appointed times to meet with Him! Christians walk in near total ignorance that all these Feast days will be kept when Yehoshua is ruling the planet, and that all the nations will come up to Israel to celebrate them, and to worship G-d, and just as the Torah will be written on their hearts, so will be the Halacha in keeping Torah that Yehohsua will write into our hearts to those of us that will be in the Messianic era, whether as Human, or Incorrupt. Why do they refuse to understand that the deposit of the token of the Ruach haKosesh into them was to begin to teach the Torah to them, in an Apostolically described way, copying their Teacher, Yehoshua as a true Disciple should? They refuse because of a lie taught by the Christian Churches from the ‘church fathers’, those disciples who learned at one time from the Apostles, and then slowly adapted the First Century Notsrim into a Greco Roman faith that truly celebrates pagan gods under the veneer of a true relationship with Yehohsua to suit their political reality rather than their spiritual one. They do not know that Grace does not replace Torah, but rather allows for us who Believe to add on Torah Observance with the enabling of the Ruach haKodesh to help us to obedience to the desire of G-d and of our Saviour, and to keep us in Righteousness as we fail in our constant humanity. Everyone who Believes should be taking the Feasts seriously, even if they refrain from keeping them as High Holy Days, or in any Jewish manner. No Gentile is required to put on Jewishness to be obedient to their Saviour, but they need to put on obedience, and walk in Yehohsua’s footsteps. May YHVH bless and keep all those who take notice of His moedim. To be fair, if you are taught something from a certain perspective, and that perspective has been foundational among Christians for hundreds if not thousands of years, it’s hard to see it any other way, even when it’s pointed out to you. I can follow the logical progression that the Church teaches about the moadim and the Torah, but since I’m looking at it from another vantage point, I can see the gaps in their reasoning. However if I didn’t have that advantage, I’d probably end up only seeing their point. We can’t blame the Christians in the pews and we can’t blame the Pastors and teachers because they are all responding to what they’ve been taught in seminaries and other religious schools. The teachers at those schools are responding to what they were taught back in the day, and so on. Only a few of us have stepped outside the box, so to speak, and looked at it from the outside. I think there’s a lot of virtue in staying in a church after coming to such a realization, but it won’t always work out for the best, as I can attest. We can’t blame the Christians in the pews and we can’t blame the Pastors and teachers because they are all responding to what they’ve been taught in seminaries and other religious schools. But they ARE to blame, because they prefer to follow the word of others in preference to searching the scriptures for themselves. They are WILLING victims to the traditions of men. They prefer to accept what others are telling them that scripture means instead of trusting the Holy Spirit – the One God sent to teach. I have no doubt you’ll come back with the same excuses and objections that you bring up every time that I address this matter. But what do YOU think is the answer to the problem revealed in your statement above? Or maybe you think there is no answer, that we can only resign ourselves to being victims of ongoing ignorance and error? Maybe you think God is unwilling and unable to reveal the truth to us, that human tradition is more powerful than He is. I’ll end this with a suggestion. What if one day we actually CHOOSE to really trust the God that we CLAIM to trust? “The DISCIPLES were first called Chrisitans in Antioch: – A Christian in BIBLICAL terms is a disciple of Jesus. “let none of you suffer as a murderer, or as a thief, or as an evildoer, or as a busybody in other men’s matters. Giving a very CLEAR contrast and distinction between the “murderer” and the “Christian” – the latter is also very clearly being associated with giving glory to God. When man’s tradtions are given more weight than the revelation of scripture there is no common foundation for fruitful discussion. In Kefa’s reference to suffering as a “Christian”, as distinct from a murderer, a thief, an evildoer or a busybody, it is somewhat clear what sort of company was associated with the term in the popular Greek mindset, and that the term was associated with real persecution. When the term was applied first to disciples in Antioch, it was as a pejorative slur by people who were not thinking at all about the metaphor whereby “Christos” or “Chrestos” was an attempt to translate the literal meaning of “Messiah” (i.e., “Moshia’h”, “anointed”). They likely were thinking too literally, rather than about the reasons why a Jewish king or priest was anointed with oil at his inauguration, or about a Jewish Messiah figure. They were thinking about “chrestos” as it was commonly used to refer to a leather shield that was smeared with protective grease, and its implications as “slippery” or “smarmy” — whereby people associated with such a term might be viewed as deceptive pretenders to the nobility of a king or priest. Kefa’s encouragement was intended to put a positive spin on a slur, and to advise patient endurance in the face of it, while rejoicing in the perspective of that positive spin with its real connection to the service of kingship of priesthood. While it’s nice to know that Kefa’s view of a “Christian” is as a disciple who may be expected to be distinguishable from a murderer, a thief, an evildoer or a busybody; that is not a lot of “biblical” information on which to hang a definition of a gentile disciple. Building such a definition was obviously as difficult then as it has been proving to be in our own days, as demonstrated by the intensive deliberations reflected in Acts 15, but at that time no one (not even Kefa nor Rav Shaul) was suggesting that it should be accompanied by the label “Christian”, even though the term was already being applied by some people in some manner in Antioch (as of the period of Acts 11, which is not very long after Kefa’s original vision about metaphorically “cleansed” gentiles). It appears that the term had been in existence for more than a decade by the time of the Acts 15 deliberations, but no one in attendence at this Jerusalem Council considered it a term to be embraced, nor used to address the non-Jewish subjects of their letter. It’s a pretty safe inference that the term was not viewed positively by anyone. Even Agrippas’ use of it in Acts 26 may have been a bit tongue-in-cheek, and Rav Shaul did not rise to the bait by repeating it or by embracing it for himself with any sort of positive spin. As I pointed out previously, the use and definition of the term “Christian” is entirely a matter of “man’s tradition” rather than any “revelation of scripture”; therefore you cannot rightly invoke some notion of anyone trying to give more weight to one over the other. As I pointed out previously, the use and definition of the term “Christian” is entirely a matter of “man’s tradition” rather than any “revelation of scripture” therefore you cannot rightly invoke some notion of anyone trying to give more weight to one over the other. PL, I’ve seen your approach to scripture and how flexibly your treat it to serve your own purposes, and I’ve seen your views on tradition. Therefore it’s not surprising that your view of who is or who isn’t a Christian takes the path of tradtion. @”O” — So are you denying clear historical records about how Christians and Christianity were defined, which are unambiguously man-made traditions? Nowhere in the three apostolic citations can you find a definition. The word “disciple” is not a definition; and the entire process by which the scriptures were compiled and preserved is nothing other than tradition. Thus I recommend not denigrating tradition, so as not to “saw through the branch upon which one is sitting”. Of course, not all traditions are created equal; therefore one must examine any given example for its qualities of accuracy, morality, historicity, et al. My “purposes”, as you call them, are to clarify the historical and cultural context that is required for proper translation and understanding of various scriptures. I don’t know what you mean by “flexibly”, unless perhaps you are referring to the nature of translation that may allow for several variations that each capture a different nuance of the original language in order to apprehend even proper meanings. PL the term Christian was first used to describe disciples of Jesus. The fact that others usurped and misused the term should be irrelevant. Murderers can no more be legitimately identified as Christian than the church can legitimately be identified as Israel – although many make the latter claim. “Disciple is not a definition”? of course not – because the Bible states that it was disciples of Jesus who were called Christians, so clearly we should avoid what the Bible says when it doesn’t conform to what PL wants to believe. We should accept his tradtion above scripture. Now, “O”, you’re beginning to sound a bit like what James calls “snarky”. The notation in Acts 11:26 doesn’t say anything about “describing” disciples. Name-calling is not the same as description, nor is it necessarily accurate — especially when that name-calling or labeling is for the purpose of persecution (as noted in 1Pet.4:16). Why, in your opinion, did Rav Shaul not acknowledge or repeat the term when King Agrippa invoked it in Acts 26:28, but rather invoked a different means of identifying what he hoped for the king to become? So tell me, “O”, how do you define a “Christian”; and what label would you apply to the many, many dedicated “Christian” churchmen who enthusiastically persecuted, tortured and murdered Jews (and even fellow churchmen and women) throughout the past 15-18 centuries? Much of their belief-structure, their “faith”, was no-doubt identical to your own. What percentage of difference between them and you would justify your denial that they were Christians while you are a true “disciple”? At what point are they merely bad or mistaken or sinful Christians, but nonetheless truly Christians, despite their deeds? I would agree with you that the scriptures suggest that the term “Christian murderer” ought to be an impossible oxymoron — except that it has occurred frequently throughout history, and does occur even today, and often it has been illegitimately justified as obedience to “Christ”. Do you think that the religious identity of a “Christian” ceases to exist or becomes forever and entirely illegitimate the moment he or she commits a murder (or any other sin, for that matter)? 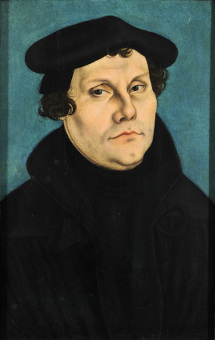 Did Martin Luther cease to be a legitimate Christian when he penned his scurrilous tract “Concerning the Jews and their lies”, in which he advocated that his government should expel us from the country, burning our books and synagogues and schools, burying whatever will not burn “in honor of our Lord and Christendom, so that God might see that we are Christians”, razing and destroying our houses, forbidding our travel on highways even to conduct business, confiscation of any wealth we might possess, imposing manual labor upon us in place of the businesses we would be forbidden to operate, and making all efforts to “convert” us? Even granting his loss of credibility or legitimacy, did Luther cease to be a “Christian”? If he was not even to be deemed a Christian before such actions, then what was he? If so much of “Christianity”, and so many so-called “Christians”, merely usurped and misused a legitimate label, who constituted the “righteous remnant” to whom you would allow legitimate use of it? Incidentally, “what PL wants to believe” has no connection to any notion of pitting tradition against scripture or accepting the former over the later. As I noted in a prior reply, the very preservation of the extant scriptures is dependent on tradition; and they cannot be understood in a vacuum without reference to at least the Jewish traditions that reflect their cultural milieu. I am curious, though, which of your toes I have metaphorically tread upon that you should resort to ad-hominum attack upon me to delegitimize my explanations? THose who carried out murders and persecutions, allegedly in the name of Jesus were not followers of Jesus, they were not disciples of Jesus, they were not Christians. It doesn’t matter what they called themselves, it doesn’t matter what organisation they belonged to it doesn’t matter how many followers they had accumulated and it doesn’t matter what YOU call them. Those who murdered did not do so as Christians. The very act of murder disqualified any claim they may have made to being Christians. A murderer can repent and be forgiven and cleansed through Jesus. But an active and unrepentant murderer is deluded if they claim to be be Christian. That is the case even if the murderer has some kind of celebrity status within the church.
. I am curious, though, which of your toes I have metaphorically tread upon that you should resort to ad-hominum attack upon me to delegitimize my explanations? There is no ad-homium attack upon you. I’m making a very LEGITIMATE challenge to the way you ignore what scripture says on the page so you can change it to mean something totally different to fit what you want to believe. I’ve seen exactly the same approach to scripture taken by teachers in the church, and just because you claim to represent Jewish tradition as opposed to church tradition it doesn’t make your approach any more legitimate than theirs. @”O” — Rav Yeshua did not criticize Jewish traditions in general, nor in the aggregate, but only certain specific traditions that reflected attitudes and perspectives that ignored or sidestepped the “spirit” of Torah. You seem to arrogate to yourself the right to ignore almost two thousand years of historical teaching and behavior that define what Christians and Christianity have been. You may not like what Christians have made of themselves, but you cannot honestly insert into the apostolic writings some alternative definition that is not found there and insist that it is the true definition. You simply lack any evidence or basis for it. Alternatively, I insist on using evidence that is verifiable in cultural and documented substantiation to elucidate the information provided somewhat cursorily in the apostolic writings which themselves reflect earlier Jewish writing that begins in the Tenakh and continues with the apocryphal writings — and they are consistent even with later Jewish literature and archeological evidence discovered in such finds as the Dead Sea Scrolls (representing a variety of ancient Jewish literatures). To put it another way, the apostolic writings are Jewish literature, and we’re taking them back from the non-Jews who have oh-so-lovingly preserved them and distorted their meaning by wrenching them out of their native context and reading them as if they were written in an antiseptic cultural vacuum — or worse: as if they were written in a pagan cultural milieu. I don’t know what sort of “teachers in the church” you may be reacting against, or whether you are trying to escape from false authorities and their errors (as have a number of former Catholics I have known), but the legitimacy of my approach is well-founded in the same foundation as are the apostolic writings themselves. These arguments between us are not about me, nor about any wish-fulfillment fantasy regarding what I want to believe (i.e., the “ad-hominum” delegitimizing you have invoked), but about the epistemology that is appropriate for interpreting literature that was penned twenty centuries ago in a land far from where most of its readers have ever lived. A significant degree of adjustment is required to appreciate the writers’ mindset and its effect on the meaning of their idiomatic phrasings that were affected by at least two languages if not more, not to neglect the issues of their translation into more modern tongues by translators influenced by their own beliefs and mindsets. I believe we began this thread by noting the problem of people called “Christians” acting badly because of the false image and beliefs and values they had been taught about a demigod-like character called “Jesus” who was quite different from the Jewish rabbi messiah character described in the apostolic writings. Each of us seeks a solution to that problem. Your proposed solution seems to be to stop calling these folks “Christians” and to demand adherence to the scriptures by anyone who can reflect that label justly. This response is quite understandable. But your solution presumes a supernaturally-guided ability for any-old-Christian to obtain from the scriptures some straightforward obvious interpretation, neglecting the regrettable fact that it is precisely the presumption of that technique which produced the traditional Christianity that embodied the problem. Your solution ignores history and the human characteristics which produced it; and it demands condemnation of even the most well-meaning disciples for their inability to divine a consistently supernatural insight into the supposedly clear meaning of scriptural passages. I am recommending a somewhat more radical solution to address the problem of misreading the not-so-obvious scriptures in the first place. oops, I invcluded my onw comments within the quote form PL. My comment starts with “There is no ad-homium attack upon you” and continues to the end.